1. Describe the internal structure of the Earth (core, mantle, crust) and tectonic plates. The crust is the outer layer of the earth and it varies in thickness from 5 to 70 km. Continental crust consist of granite and is less dense. Oceanic crust consist of basaltic rocks and 'float' on the mantle. Mantle is the second layer of the earth's structure which is 2900 km thick. It is divided into upper mantle and lower mantle. The upper mantle is a layer of solid rock and asthenosphere. Below the uppermost mantle, rocks are close to melting point and easily deformed as the temperature is between 800⁰C and 3,000⁰C. Convection currents carry heat from the hot inner mantle to the cooler outer mantle. The outer core is about 2100 km made up of molten iron-nickel (liquid) and the inner core is about 1200km consists of solid iron nickel and is very hot and under great pressure. 2. Describe the tectonic plates. Continental crust – found beneath the earth’s continental land masses and under shallow seas close to continents, it is thicker between 30 and 60km but is made of lighter rocks including granite. 3. Explain the movement of plates. · Movement of crustal plates is driven by convection currents and slab-pull force. · Convection currents occur when materials in the mantle is heated by the core, causing the mantle material to expand, rise and spread out beneath the plates. This causes plates to be dragged along and to move away from each other. Then the hot mantle material cools and sinks, pulling the plates along. The sinking mantle materials heats up again as it nears the core and the whole process repeats. · Slab-pull force occurs when the denser oceanic plate is force beneath the less dense continental plate resulting in subuction. As the plate subducts, it pulls the rest of the plates along. The subducting plate drives the downward moving portion of convection currents. The mantle material, which is found away from where the plate subduct, drives the rising portion of convection currents. Describe the global distribution of tectonic plates and types of plate boundaries. · Transform: where plates move past each other e.g. San Andreas Fault between the Pacific plate and the North American Plate. 5. Describe the characteristics of landforms associated with plate movements. • As the plates move apart due to convection currents inside the Earth. magma rises from the mantle to fill the gap between the plates as they diverge. • New sea floor is formed when the magma cools and solidifies. This process is called sea-floor spreading. • Magma rises at the zone of divergence/spreading zone to form a ridge of new ocean floor called mid-oceanic ridge. • The newly formed (youngest) rocks are closest to the middle of the ridge/plate boundaries. • At various points along the ridge, magma builds up above the ocean to form volcanic islands. • E.g. the Mid-Atlantic Ridge is found in the middle of the Atlantic Ocean cutting across Iceland, a volcanic island. • When two oceanic plates converge, one subducts under the other. • A subduction zone forms, creating a deep oceanic trench. • The subduction of the oceanic plate causes the solid mantle material to melt and magma is formed. • The magma rises through the mantle and ocean floor to emerge as volcanoes. • Eventually a chain or arc of islands called island arc is formed. • Earthquakes may also occur. • Plates made largely of continental crust may collide with other plates made largely of continental crust. • However, both plates have similar densities and hence, resist subduction. • Instead, the plates break, slide along fractures in the crust and fold, forming fold mountains. • E.g. the Himalayas - convergence of the Indian Plate and the Eurasian Plate. • When an oceanic plate meets a continental plate, the denser oceanic plate subducts under the less dense continental plate. • A subduction zone forms, creating a deep oceanic trench along the plate boundary. • The subduction of the continental plate causes the soild mantle material to melt and magma is formed. • The magma rises through the mantle and crust to emerge as volcanoes on land. • The edge of thick continental plate buckles to form fold mountains. • E.g. the Australian Plate subducting under a section of the Eurasian Plate near Sumatra formed the Sunda Trench. • Plates slide past each other. • As they do so, tremendous stress builds up. • This stress is eventually released, often as a violent earthquake. 6. How is a fold mountain formed? • Over millions of years, the folding of rocks creates a landform called fold mountains. • The Himalayas, the Rocky Mountains and the Andes are examples of fold mountains. • Fold mountains are formed along convergent plate boundaries. • The compressional force causes the layers of rocks to buckle and fold. • This process is known as folding. • The downfold is the syncline. • When there is increasing compressional force on one limb of a fold, the rocks may buckle until a fracture forms. The limb may then move forward to ride over the other limb. 7. Describe the formation of Rift valleys and block mountains. Rift valleys and block mountains are formed at divergent plate boundaries. • A fault is a fracture in the rocks along which the rocks are displaced. • The tensional forces result in parts of the crust being fractured. • This process is called faulting. • A rift valley is a valley with steep sides formed along fault lines. • A block mountain is a block of land with steep sides. It is formed when sections of the crust extend along fault lines and rock masses surrounding a central block sink due to tensional forces. Is formed from the Nubian section of the African Plate and the Somalian section of the African Plate pulling away from one another. 8.Describe the formation of volcano. A volcano is a landform formed by magma ejected from the mantle onto the earth’s surface. Magma is molten rock found below the earth’s surface. Magma that is ejected onto the surface is known as lava. The lava cools and solidifies in layers and form a cone-shaped mountain called a volcano. 9. Describe and draw the structure of volcanoes. 11. Explain the shape and size of volcanoes. Volcanoes vary in shapes and sizes due to the characteristics of lava. Low silica lava has low viscosity (stickiness) while high-silica has high viscosity. 10. Explain what is a active, dormant or extinct volcano. Extinct volcanoes – volcanoes without current seismic activity with no geological evidence of eruptions for the past thousands of years. 11. Describe the distribution of volcanoes. 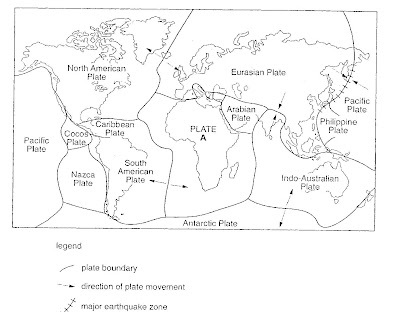 Mainly along the Pacific Ring of Fire which is the boundaries of several converging plates – Pacific Plate, Nazca Plate, the Philippines Plate and the Eurasian Plate. 12. Explain the cause of earthquake. Earthquakes occur at the plate boundary because this is the most active part of the earth’s crust. As plates converge, one plate is being pushed underneath another, and a zone of subduction is formed. As one plate moves over the other, the movement is not smooth because the surface of the crust is not smooth. There is friction and this friction causes the movement to jerk. The crust is also under great stress when the plates move in opposite direction. The stress in the rocks is so tremendous that it finally causes the rocks to jerk free. The release of tension in the form of seismic waves made the ground vibrate. After an earthquake, a series of smaller earthquakes called aftershocks occur along the fault line. Focus is the place where the earthquake takes place. Epicentre is the point on the surface above the focus. 13. Explain why some earthquakes more damaging than others. Some earthquake causes more damage because the intensity of the earthquake differs. Places located near to the epicentre will experience high intensity of the earthquake and thus suffer the greatest amount of damage. The damage also depends on the depth of its origin – a deep-focus earthquake ( 70-700km below earth surface) has a smaller impact on the land compared to a shallow-focus earthquake (upper 70km of earth crust) as seismic waves take a longer time to reach the surface and would have lost most of their energy by then, A seismograph is used for recording earthquake. The intensity of earthquake is measured on the Richter scale graded from 1 to 9. The higher the number on the Richter scale the greater the intensity of the earthquake. The stronger vibration will lead to the collapse of more buildings and infrastructure which in turn results in more casualties and damage. Population density which is the the number of people living in the affected area is an important factor, Earthquakes in sparsely populated areas are likely to affect fewer people than in densely populated areas. For example, an earthquake in a city can cause more casualties and damage than an earthquake in the countryside. The 2001 Kunlun earthquake had a magnitude of 7.8 but 0 casualties due to low population density. Similarly, several earthquakes occur at Solomon islands in 2015 but there are no casualties. The extent of damage also depends on the amount of development in the areas where earthquake takes place. An earthquake which struck a desert is less damaging than in a city. The foundations of the buildings and bridges are also important because if the foundation is good, it will withstand the vibration. Developed areas suffer more damages as water and gas pipes broke. Urban areas are heavily built up with dense population densities and heavy traffic movements. As residents in big urban areas usually live in high rise buildings because land is scarce in the cities, damage to properties and loss of lives can be phenomenal as the high rise building collapse when earthquakes occur. As building collapse, other related hazards usually occur such as fire from damaged power lines. Destruction to highways, streets, flyover and bridges leads to widespread traffic congestion and commuters may be killed and hurt. Telephone line and power supply will be disrupted, and this will affect communication with outside world which in turn will hamper rescue work. The strength of the earthquake also depends on the the geology of the epicentre. e.g. Mexico, built on layers of mud and sand, vibrates like jelly in the 1985 earthquake which killed 7000. In Christchurch, many houses and buildings had to be abandoned because of liquefaction where the ground becomes unstable and saturated soil flows like a liquid after the earthquake in 2011. The damage also depends on the level of preparedness and time of occurrence. Preparations such as having evacuation plans, trained rescue workers and other action plans can make the damage of an earthquake more manageable if the people are more prepared. If the earthquake occurs when most people are sleeping, there is a higher chance that more deaths will occur as they are trapped in their houses. E.g. more than 2400 people died when an earthquake occurred after midnight in the Sun Moon Lake Region in Taiwan in 1999. 14. Explain the hazards associated with earthquakes. • Disruption of services - An earthquake can disrupt services such as the supply of electricity, gas and water. The earthquake in Kobe, Japan, in 1995 disrupted electricity, gas and water supplies to about a million of Kobe city’s 1.4 million residents. · Fires are started due to rupture gas pipes which provide fuel to start fires as well as exposing electrical cables which ignite flammable items. The earthquake in Kobe, Japan in 1995 caused extensive fires that raged on an off for 2 days and it spread quickly due to strong winds. The firemen were unable to control the fires as there was no water supply due to ruptured water pipes. · Landslides caused by earthquakes which weaken the slopes of hills and mountains due to the shaking of the ground. In 1970, an earthquake off the coast of Peru triggered a massive landslide on the slopes of Mount Huascaran and destroyed the town of Ranrahirca killing 18000 people within seconds. · Destruction of properties – the earthquake in Tohoku, Japan in 2011, caused a tsunami which travelled up to 10km inland, causing extensive structural damage resulting in hundreds of thousands of people forced from their homes. There was a severe shortage of housing and long-term consequence on the health of people. · Destruction of infrastructure –earthquakes cause cracks to form in infrastructure such as roads and bridges. Transportation can be disrupted as it is unsafe to use the damaged roads. · Aftershocks -there could still be aftershocks of lower magnitudes as there are adjustments to the repositioning of the fault. As many buildings are already weakened by the main shock, the aftershocks will cause more collapse and there will be more casualties. Dead animals and corpse will start to rot and if not disposed quickly, there might be an outbreak of epidemic such as Malaria. 15. Explain the cause of tsunamis. · A landslide triggered by earthquake or volcanic eruption which causes materials to plunge into the water. 16. Describe the benefits and risks of living in volcanic areas. · Volcanic regions are often rich in sulphur deposits which can be mined for industrial use. E.g. In East Java, Indonesia, the sulphur collected is used to make matches and fertilizers, and refine sugar. · Volcanic areas offer spectacularly beautiful attractions for tourists. e.g Mt Fuji in Japan. Volcanic areas can be rich in history e.g. ruins of Pompeii in Italy where Mt Vesuvius erupted in 79 CE and buried the town. Every year, almost 3 million people visit the unearthed archaeological site which revealed buildings, pottery and mosaics left intact. · In some parts of the world, valuable materials such as gold, iron and diamonds have been formed by volcanic activity, and large mining centres have developed. The old volcanic rocks at Kimberly in South Africa are one of the world’s richest sources of diamond. · Volcanic eruptions claim many lives and destroy buildings and property. The lava, with high temperatures of between 500ºC and 1400 ºC burns the area it flows through. Volcanic bombs of heated rocks destroy property around the volcano e.g. eruption of Kilauea in Hawaii destroyed many homes and highway. · Poisonous gases such as compounds of sulphur, carbon monoxide and carbon dioxide are produced. Inhaling the hot ash and gases can result in serious injury or death. · Landslide can occur due to collapse of a volcanic cone. Landslides can obstruct the flow of rivers causing floods, block roads, and bury villages and farmlands. The eruption of Nevado del Ruiz in the Andes mountain of South America in 1985 caused lahars which killed more than 20000 people in the town of Armero. · Ash and volcanic dust ejected by volcanoes may be blown away to pollute the air and disrupt human activities over a large area from the volcano. It can block sunlight, suffocate crops and cause severe respiratory problems for people and animals. The eruption of Eyjafjallajökull in Iceland in 2010 resulted in the closure of air space over much of Europe as the volcanic particles pose a serious danger to aircraft engines and structures. Connecting flights worldwide were cancelled and delays to 1.2 million passengers daily cost the airline industry a total of US$1.8 billion. · When snow-capped volcanoes erupt, a sudden flash flood will also result from the melting of snow and ice. Mudflow may also be produced. · Sulphur dioxide released from volcanic eruption may react with water vapour and other chemicals in the atmosphere to form sulphur-based participles which can reflect the sun’ energy back into the atmosphere and temporarily cool the earth. The 1815 eruption of Mount Tambora in Indonesia cause the global temperatures to drop by as much as 1.7ºC. 17. Discuss the responses of people to earthquakes and tsunamis. Fatalistic approach – people who accept earthquakes as unavoidable events and may resist evacuation in the face of the threat of an earthquake. Common for communities in less developed countries with limited access to other places. Acceptance approach – people who accept the risk of living in earth-quake prone areas because the benefits of living in those areas outweigh the costs of moving away. Common in developed countries. Adaptation approach – people can successfully live in earthquake prone areas when they are well prepared with measures such as earthquake monitoring devices, risk assessments, planning structures and technology as well as support by well-equipped rescue teams. Most effective approach to saving lives and property. · Restrict developments in certain areas which are at risk of earthquake or liquefaction. · In California, USA, all new buildings are not built across fault lines or areas at risk of liquefaction. Development on low lying areas prohibited except for areas with protective barriers such as seawalls along the coasts of Japan and North America where the Pacific Ring of Fire is located. · Some areas may already be built-up or are privately owned. In some cases, government authorities would buy land from private owners and compensate those who have to move. These strategies are costly and some private owners may be reluctant to move as they often believe that another hazard would not happen. · Damping devices as shock absorbers and counter-weights which move in the opposite direction to the earthquake. · Damping devices prevent a building from swaying too much and collapsing. Base isolation bearings absorb the force of the earthquake and reduce the movement of the building. e.g. lead rubber bearings used at the Sabiha Gökcen Airport in Istanbul. · Higher cost of construction and maintenance of buildings. · Expensive to convert existing buildings to include earthquake resistance features. If conversion is too expensive, buildings have to be demolished and rebuilt e.g. Beijing, China in 2011. · Roads, bridges and dams built to resist the shaking of the ground so that they do not collapse or can be easily repaired if they collapse. · Homes, office buildings and factories fitted with trip switches that ensure all electrical points are switched off in the event of an earthquake. · Large underground water tanks provide emergency reservoirs for possible fire fighting after an earthquake. · Although reinforced infra-structure remains untested until earthquake occurs, past earthquakes in Chile, Japan and California showed benefits of reinforced infrastructure such as fewer lives lost, faster rescue and evacuations, and less money spent on recovery for the affected areas. · In Japan, machines in many factories automatically shut down when they sense earthquake vibrations which helps to prevent fire outbreaks. Underground water tanks are found in Tokyo, Kyoto and Kobe in Japan. Developing infrastructure to resist earthquake is costly. · People take part in emergency drills by moving to safe locations, listening to instructions given by trained personnel and practicing first aid. · They may also become members of local response teams that assist people during a disaster. Japan conducts emergency drills on 1 Sept to commemorate Disaster Prevention Day which prepares the people mentally on how to create to a disaster. Main roads are blocked and emergency vehicles have to seek alternative routes to reach affected areas. · As emergency drills are designed based on the most serious earthquake ever recorded in the area in the past, the emergency frills and evacuation plans might not prepare them adequately to prevent the devastation of the areas such as the 2011 earthquake in Tohoku, Japan. There might be insufficient time for evacuation as earthquakes are difficult to predict. · Installations of earthquake sensors in earthquake prone zone help monitor the frequency of vibrations and detect possible developments of an earthquake. E.g. earthquake motion data is gathered from observation stations installed on bridges and roads in Japan which enables an earthquake to be predicted. The sensors also help to quickly estimate damage to bridges, railways or other infrastructure. · Earthquake sensors are expensive to obtain, install and use. · Warnings may not provide sufficient time for an evacuation. · Noise, lightning or device failure may interfere with seismograph and result in false warnings given. 19, Evaluate the short term and long term responses to earthquakes. Short term responses are important in saving lives however long-term responses need to be put in place to save more life if an earthquake strikes again. People trapped under collapsed buildings must be quickly located and freed. Some survivors are found after being trapped for a couple of weeks without food. This will help to save life for e.g. after the earthquake in Tohoku, Japan, in 2011, sniffer dogs and heat sensors were deployed and successfully rescued man who are trapped. However, rescue workers only have a limited time of 72 hours to find trapped survivors as they can only survive 3 days without food and water. E.g. rescue workers only have 3 days to search through 2 towns after the earthquake in Tohoku in 2011. It is also important to provide medical aid, food and clean drinking water provided to survivors to prevent dehydration and spread of disease. Provision of immediate aid helps survivors continue with their lives. e.g. after the earthquake in Afyon in 2002, the Turkish Red Crescent Society responded by delivering 20000 tents, 50000 blankets and 3000 heaters to the region. However, medical supplies, food and water may not be sufficient and this may cause social unrest. E.g. after the earthquake in Haiti in 2010, looting and fighting broke out as people fought for food and medical supplies. Immediately after the earthquake struck, it is also important to manage the status of the affected areas. The affected areas are declared as ‘emergency zone’, a specialized authority is assigned to provide immediate aid to people and restore emergency services to affected areas. The basic needs of the affected people such as food, water and shelter are taken care of. e.g. the Crisis Management Centre led by the Ministry of interior mobilsed and coordinated relief effectively within the first few hours of the earthquake in Afyon, Turkey in 2002. However, some countries are not experience is handling the aftermath of an earthquake. e.g. the earthquake in Haiti in 2010 – the emergency relief lacked coordination and proper supervision, making it difficult to provide aid to affected population. Tent cities are set up as temporary housing for those who have lost their homes in the earthquake.Temporary shelters provide a place for survivors to carry on with their lives. E.g. tents accommodated thousands of homeless people after the major earthquake in Afyon, Turkey, in 2002. They helped to re-establish a sense of community amongst survivors. However, the living conditions in tent cities may be poor and lead to people dying. E.g. the outbreak of the water-borne disease, cholera, killed almost 4000 people in the tent cities of Haiti. There is a also a need to call for humanitarian help such as aid from foreign and local governments in the form of money, medical or food aid to an affected area. Affected areas can be rebuilt with the aid provided. e.g. 2 months after the earthquake in Haiti in 2010, governments around the world donated US$2.5 billion and pledged another US$1.3billion. Non-governmental organizations such as International Red Cross and World Vision International rapidly moved into affected areas and began their work. However, Aid may be delivered later than hoped for may not always be delivered. However, problems such as looting of trucks may also arise while aid is being delivered. e.g. after the earthquake in Turkey in 2011, trucks delivering aid were looted before they reached the disaster area. Long term responses must be put in place as it helps to save lives from another earthquake which may strike again. Infrastructure and amenities are rebuilt and improved upon after a disaster.·Authorities develop stricter building codes to ensure infrastructure is restored at a higher safety level than before. eg. after the earthquake in Kobe, Japan in 1995, Japan spent billions developing technology to build more earthquake-resistant buildings.However, reinforced building built to protect against earthquakes, are not necessarily protected against tsunamis. Additional protection such as breakwaters needed. e.g. many of Chile’s building are earthquake-resistant, the coastal areas suffered massive damage from a tsunamis when an earthquake struck in 2010. Compensation is given out through insurance or direct payments to people who have lost their land and property.Compensation helps people in finding another place to settle down. e.g. the Japanese insurance plans authorized by the government to pay massive amounts to compensate people who have lost their land and property. However, compensations offered are often insufficient. e.g. insurance paid in Japan have an upper limit – people who have lost their land and property may not receive amount enough to cover the cost of the damage. Steps are taken to ensure that the economy recovers.·The government stimulates the economy by introducing various measures. e.g. direct cash payment were made to individuals to allow them to buy necessities after the earthquake in Christchurch, New Zealand, in 2011 to stimulate the local economy as it provided income for local traders. In addition, the New Zealand government guaranteed bank credit and insurance payments so that reconstruction could start quickly. However,the recovery of the economy may take a long time as a huge sum of money is needed to rebuild infrastructure and services.E.g. China took 3 years to rebuild the area hit by the earthquake in Sichuan, China, in 2008 and provide people with basic living conditions. A huge sum of about US$123 billion was spent on reconstructing schools, hospitals and homes. Health options such as long-term counselling are provided. The loss of loved ones, homes or jobs after earthquakes cause long-lasting trauma. Problems can be identified and addressed early. E.g. a year after the earthquake in Christchurch, New Zealand, in 2011, significant problems of anxiety and depression were identified amongst the affected population. This resulted in a greater number of health workers being deployed in the area. However, improving health options, such as restoring the resilience of people after an earthquake, can be very challenging. e.g. many survivors such as those in Haiti, continue to lack access to basic necessities after the earthquake in 2010. Short term responses are those that occur immediately and last for weeks after the occurrence of an earthquake. Short-term responses are important as it can help to save lives. Long-term responses to earthquakes can stretch over months and years and involve rebuilding an affected region. However, carrying out such measures and responses can be costly. 1 Response to "Notes on Tectonic hazards"
The questions were really useful!